The explosions were coming at more regular intervals now. The temple had stood for centuries high in the lush jungle. Kang looked angrily at the Y-wings dropping their bombs. He had flown those very same space craft against the Separatists and now they were being used to wipe out the Jedi. A thousand Reptus Jedi had trained there along side their brothers and sisters from many other races. The Jedi had been able to hastily install several laser cannons to buy time for the evacuation. A ragged band of cargo haulers, freighters, and various other space craft were being loaded with everything from ancient artifacts to personnel. The attack had come earlier than expected. The Empire had swept aside the brave pilots that had been sent to hold them off. This attack had been well planned and no one had suspected the number of ships the Empire had committed to this attack was possible. Kang stood looking out the temple window. The beautiful stained glass artwork was now only a thousand pieces of shattered glass strewn all over the tiled floor. He was angry. Angry to see the brave clone troopers that he had fought side by side with for all those years had become tools of destruction. The Emperor had decided his empire would be a one with out the Jedi. It would be a human run empire. There would be no room for other races in this new order of things. “Are you ready Lore?” Kang asked calmly. The two hurried down the hall. By now most of the others in the temple would have left. Kang looked again out of one of the windows as they ran down the corridor, assault landers were beginning their approach. Soon the temple would be over run by clone troopers finishing off anybody unlucky enough to be left behind. The bombers hadn’t quite finished yet and parts of the temple were starting to collapse. They had come to a bridge that had been blown apart and they realized they were on the wrong side. Suddenly blaster bolts began to explode just inches from them. The clones were right behind them and closing. Kang turned on his light staff and easily deflected a shot that would have hit Lore. Lore smiled at Kang and turned on his Jedi force gauntlets. These were rarely used by Jedi as they were only used in hand to hand combat and did not have the reputation of a light saber. Lore quickly showed his skills with the gauntlets as he deflected two bolts back at the clones that fired them killing them both. The clones pressed on taking loses without any hinderence in their efforts. Without any warning Kang grabbed Lore by his middle and took two great strides and lept from the bridge. They fell forty feet below into the river with a titanic splash. Kang knew the blaster bolts couldn’t penetrate the water enough to do them any real damage. Kang pushed Lore up out of the water just long enough for him to take a breath before they went over the falls. Kang fired his grapple gun and the grapple hit the far bank opposite the clone troopers. With a bone jarring jerk the cable sprung tight and the two swung to the far canyon wall. When they hit Lore was knocked out of Kang’s grip and fell. He was able to control his fall enough to grab the plants and vines that covered the canyon walls and stop himself from falling further. Kang was still hanging onto the cable trying to grab the cliff wall for a foot hold. “Look out !” Lore could hardly be heard above the torrent of water crashing over the falls. Kang looked up just in time to see several grenades falling from the clone troopers position above. At the last possible second Kang released the cable and with his huge legs pushed off into the air towards the other side of the chasm. The grenades exploded one, two, three above him as he fell. Kang could feel the hot shrapnel hitting him and his armor. He grabbed for a tree branch but it cracked almost immediately under his weight causing him to smash into several more and land on a mossy outcropping of rock. Lore fired his grapple at the side Kang was on and swung over landing just above Kang’s motionless body. “Have they killed you?” Lore asked sarcasticly as he tried to urge Kang back into action. “That day has not seen the sun.” Kang said referring to the old Reptus tale about one of his childhood hero that refused to die until the day determined by the Force arrived. “Good, then get up my grand monster and let us show these traitors how a Reptus pays those who have betrayed them. Kang new it wasn’t the clone troopers fault, the day of betrayal had been bred into them. They had no choice. However it had gone past reasoning with them. He knew Lore was right and combat was called for. “The hangar bay, we shall begin our bloodletting there.” Kang said getting to his feet. The blaster fire was now getting closer as the clone troopers above began to pursue them using their own grapple lines and repelled down into the canyon. Kang looked down at the bottom of the chasm. “I don’t think the fall will kill us.” he said looking up at Lore. “Then what are we waiting for?” Lore replied. And with that the two smiled at each other and jumped. The clone troopers fired at them as they fell into the mist from the falls and disappeared. Lore was the first to make it to the cave mouth behind the falls. He took the re-breather from his mouth and searched the dark shore for Kang. He didn’t call out for fear of the clones hearing him. It had been too long and he began to fear the worst. Lore caught some movement to his left and saw the Kang walking up out of the water slowly. “What took you so long?” Lore said relieved. “Damned armor was too heavy, I had to walk on the bottom to get out.” Kang said after removing his re-breather. that honeycombed the mountain under the temple complex. Kang turned on his light saber staff and with that small amount of illumination they began to trek back up the narrow passages towards the hangar bay. It would not be easy due to the fact that many creatures had made their home in the dark recesses of the mountain and not all were small and cuddly. Some were the kind that ate small and cuddly things, others ate the things that ate the small and cuddly things. The worst was the Vendril spider. They live for hundreds of years and can grow up to twenty feet across. They begin their lives the same size as most spiders but they never stop growing as long as they have a reliable food source. They can push themselves into tiny cracks in the cave walls and lay motionless for months waiting for their prey to scurry past. This allows moss and fungus to grow on them that aids in their camouflage. Other times they will go hunting and actively pursue their meals. The unpredictability of these spiders is one of the reasons for their lethality. The floor of the cavern was slippery from years of the waterfall’s spray being blasted into the opening. They found the opening too the main tunnel at the back. It was surprisingly large and they made good time all the way to the first intersection. This part was also large and there was a well maintained stairway leading up. The vibrations of the bombs could still be felt even this far down. “They mean to raise it to the ground.” Lore said solemnly. “Don’t worry my friend, it will be our turn to do the same for the Emperor soon enough.” Kang said in a cold steady tone. Lore knew the tone of his large friends voice well enough to know he was glad he wasn’t facing him in combat. Kang was even tempered and almost never lost his composier. When his voice took on the tone it had it showed pure focus in what he needed to do. He was focusing on having to do violence. He had to do it to keep himself and his friend alive. Lore feared for his opponents. They had reached the top of the stairs and came to an opening that was in the far corner of one of the landing bays. The room was not as large as the ones above but they could see two landers unloading their clone troopers. Lore knew it would be futile to ask Kang to wait. Without a sound Kang began his charge. He was halfway to the troopers before any realized what was happening. Lore saw the troopers shouting orders to one another and taking up firing positions but it was already too late for them. With a mighty battle cry Kang leapt into the air and crossed the remaining distance with ease. No one would have thought such a giant could leap like that. Kang was a Jedi and possessed all of their skills. A leap like that was simple to one trained in the ways of the Force. He easily deflected several shots the clones had gotten off before he landed. Kang smashed into the first group like a stampeding bantha. He deftly parried blaster shots and cut into imperial armor to the screams of his victims. Lore knew his task was to support Kang’s attack. He was smaller and faster than Kang so he would plug the gaps where needed. Kang continued his onslaught to the point of using his huge fists to smash his victims helmets into pulp. Lore had made it to the landers by now. He was intentionally drawing fire from the second crew and deflecting it with his gauntlets back at each trooper that fired. Lore’s fighting style was very different than Kang’s. He made short fast leaps and feints as he crossed the distance. He was making himself a target to keep Kang from being shot by one of the clones he wasn’t physically engaged with. The clones had to keep changing position as he began to cross behind the opposite side of the lander. They had to stop shooting so they could move to his new location but by the time they had gotten there he was moving again. He was buying time for Kang. Kang was the real danger but he kept the second group focused on him. Kang had finished with his group and saw their lander lifting off. In one fluid movement he lifted a dead trooper over his head and threw the body into the engine intake. There was a loud explosion as the bits of the clone spewed out of the engines exhaust. The lander spun to the right and slammed into one of the roof supports with a loud bang. Kang leapt inside the lander and Lore lost sight of him. After a few seconds Lore could see the pilot struggling in the cockpit then he disappeared. A few seconds later the same thing happened to the gunner. Kang stepped out of the smoldering wreck dragging the two crewmen s bodies with him. He had torn them from their seats from the inside breaking their backs. The second lander was now leaving as Lore kept up his distraction. He saw his chance and leapt onto the top of the pilots canopy. Making a fist and focusing the force into his gauntlet he punched through the canopy and smashed the pilots skull. Lore’s tail had a simple metal weight on the end of it. With one lightening fast whip he brought it down through the gunners canopy striking him dead. The lander was now completely out of control and was spinning around wildly in the hangar bay. Lore jumped into the middle of the troopers and spun and punched with his charged gauntlets. He was like a blur anticipating each troopers every move. His tail swung around him below knee level knocking down any trooper that got in it’s way. By now Lore was getting tired and could use some help but before he could call to Kang he saw Kang’s light saber staff cutting it’s way toward him. Kang had his full blood lust up and was wading into the troopers like a creature from a nightmare. He was swinging his weapon with one hand and using one of the troopers heavy blasters as a club breaking arms and legs as it was bent and twisted more and more with each blow. At one point Kang used his huge jaws and bit off a troopers arm. Even Lore who had seen him in battle before was shocked at his rage over the clones attack on the temple. The lander finally spun around one last time and slid out of the hangar bay and tumbled burning into the jungle far below. The battle was now over and Lore fell to his knees exhausted. Kang threw back his head and let out a loud battle cry. The hangar bay was filling with smoke from the remaining lander as it slowly began to burn. The floor was covered with the bodies of at least twenty clone troopers and their equipment both smashed and broken. Lore noticed for the first time that Kang had been hit several times but because of his armor he couldn’t tell how bad the wounds were. “Kang, you’re hit, is it bad?” Lore asked concerned. “Right, lead the way old friend.” Lore said. He knew there was no way they would leave this place alive but if Kang wanted to believe it fore a while more he would go along with it. They once again entered the tunnels and began to climb the stairs towards the largest hangar bay on the upper levels. It was tough going for Kang due to his wounds that he still did not allow Lore to examine. Lore did not press the issue. He knew what their fate would be, so why waist time dressing wounds. This next action would be their last. Lore began to cheer up. He had always feared a long slow death by illness. Kang and he were Jedi warriors. He always knew and had prepared himself for the day of their final battle. After a while they came to the secret entrance at the rear of the hangar bay. Lore carefully looked out into the room. Kang sat at the top of the stairs and to catch his breath. There were about one hundred clones and their landers already occupying the hangar. Several Jedi lay dead laid out in a long row. The clones were being very efficient in their operation. They were making sure which Jedi had been killed and who was still alive. It was all very cold and clinical. These dead Jedi had become just numbers in the empires plan. These brave men and women who had given their lives in the protection of others were now just numbers in the tally. If Kang were to see this there would be no holding him back. This wasn’t war, this was extermination. Lore looked at Kang sitting on the stairs breathing heavily. He didn’t want to watch his friend die. He needed a plan to get them out of this place. Suddenly to his amazement a voice came over his comm-link. It was on an old Jedi emergency channel, one not used for years. 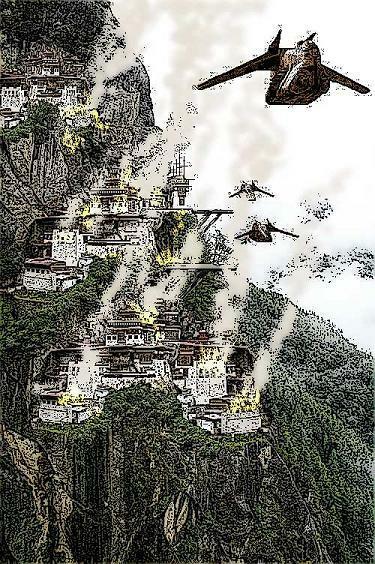 It was a woman’s voice telling any surviving Jedi to come to the far side of the temple mountain for a rescue flight. Lore couldn’t believe it. It must be a trap. It would be possible for the empire to have obtained an old code to use as a trap. He looked at Kang, he was fading fast. Lore reasoned that if it was a trap they could kill those lying in wait as easily as the clones in the next room. At least there was a chance for his friend if they went to the rescue flight. “Get up my friend and we will see what kind of trap that they have for us.” Lore said to Kang. Kang pushed himself up and smiled at Lore. He was far to weak to answer. They began the long trek through the ancient passageways to the far end of the mountain. Luck was still with them as most of the trip would be downhill. The two wound their way through the passageways for about an hour. Every few minutes they would hear the message over the comm-link telling them where to go. They stopped and rested in a large cave. It was pitch black except for the glow of Kang’s light saber staff. Several long black stalactites were jutting out from the wall. As they caught their breath Kang kept studying the stalactites. They seemed odd the way they came out from the wall and bent at sharp angles down to the floor. Most stalactites hung down from the ceiling in caves as he recalled. “Isn’t that strange how they stick out from the wall like that?” Kang asked Lore panting. “What ?” Lore wasn’t sure what Kang was talking about. “Those stalactites, they stick out from the wall instead of hanging down.” Kang said pointing at the formation with his staff. Lore leaned closer and looked at the stalactites. “That is strange, they shouldn’t do that.” Lore said now becoming interested in the oddity before them. “Wait, what’s that reflecting in that crack in the wall behind them?” Kang said squinting. The huge spider had been hiding in this crack for weeks waiting for a meal. It suddenly sprung out of the gap flailing it’s long moss covered legs like some kind of nightmarish party favor. Lore screamed with complete surprise at the suddenness of the attack. Kang fell back on the floor and scrambled to gain distance. The creature let out a horrible shriek as it lunged forward toward Lore. The legs stabbed at Lore just missing him. His Jedi reflexes had saved him from the first attack. Lore leapt back towards Kang to help his friend fight the spider that was now being attracted by the glow of the staff. Kang parried blow after blow from the massive legs the beast was too close for him to use the light sabers tip. There was little Lore could do at this point. His only hope to do any real damage to this monster was if he could get in close enough to punch it with his gauntlets but the legs were in the way. “Look out! “ a voice shouted from down the next tunnel. Two shots from a blaster pistol hit the spider in the head causing it to recoil in pain. There was a quick flash of a light sabers blade and two legs came off as well. The spider screamed in pain as it pushed itself back into the crack for safety. “ Jaycee! Fry it !” yelled the woman and a second smaller female rushed up and fired some sort of flame thrower into the crack setting the spider on fire. The spider flailed and screamed as the first woman emptied her blaster pistol into it’s twisting body killing it. “Looks like we got here just in time.” said the first woman. She was tall and had dark hair, nearly black. The purple glow from her light saber reflected off her piercing violet eyes. The second woman was smaller and wore work coveralls . She had what appeared to be a home made flamethrower on her back. Kang and Lore were speechless. Everything had happened so fast they just stood there looking at each other. “The name is Stella and this is Jaycee, we’ve come to help.” said the taller of the two. She seemed calm but her tone was of urgency. The smaller woman was obviously newer to this sort oh thing and remained calm but was defiantly taking her cue from the taller one. “How bad are you hurt?” Stella asked Kang. “I’ll make it.” was all he could get out. Lore helped Kang by getting under his arm. Stella did the same with out hesitation. “ Okay Jaycee, just head back the way we came. You need to lead the way now.” Stella said in a reassuring tone. It was clear that the smaller woman was new to all of this but she had remained calm and did what Stella told her to do. The four made their way back down the passage to a large cave. It appeared to be high up on the mountain. They could see out the opening clear across the canyon. Lore saw smoke coming from below the opening, most likely from part of the temple complex burning below. There was a single heavy fighter sitting near where they had come out of the tunnel. It was quite beat up and was no stranger to battle. Lore couldn’t figure out what race had manufactured it because it appeared to have been modified extensively. The overall color scheme was blue with a lot of the paint burned or blasted off. This was a real “working” ship, not for show. Jaycee spoke a command into her comm-link and the rear door opened. Lore and Stella helped Kang into the back and laid him on the floor. Jaycee had slipped by them and was turning every thing on getting the ship ready for flight. “ We’re in for a heck of a ride friends. The sky is crawling with Imperial ships but not to worry, this old pile of junk has gotten me out of tighter spots than this.” Stella said smiling. Kang looked up at Lore. He grabbed Lore’s arm and said, “You can trust her, I get a good feeling about these two.” Kang’s head fell back as he passed out. “Stella ! We have company!” Jaycee yelled. Stella looked out at the cave mouth to see a gunship hovering just in front of it. They had been spotted. Stella leapt past Jaycee landing in the pilots chair. She grabbed the trigger on the joystick and squeezed. The ship had two forward turrets with two guns each. The guns erupted in a blaze of chattering gunfire that lit up the gunships engines causing it to veer off for cover. “Shut the door Jaycee!” Stella yelled as she jammed the throttle forward. The rear door was still closing as the old ship showed what it was made of. Lore was thrown to the rear of the ship and slammed into the back door. He saw Jaycee trying to climb into the gun turret above but was hanging straight back horizontally looking back at Lore with her eyes as wide as they could get. “This happens all the time.” Jaycee yelled above the roar of the engines as the ship launched itself from the cave mouth like a rifle bullet. Lore was trying desperately to grab onto something as the ship made a series of violent maneuvers that left him floating in mid air or pinned to one side of the ships interior or the other. Kaycee had miraculously made it into the gun turret and strapped herself in. Kang had luckily become wedged under a bench and was spared most of the beating Lore was getting. Lore looked out the rear view port and saw three Torrent fighters closing on the rear of the ship. “Jaycee ! Check your six!” Stella yelled. “I see ’em, I see ’em!” Jaycee yelled back as she swung the turret around to the rear. Jaycee leaned forward and put her eye up to the gun site and smiled. The twin guns began to bang away. They were modified laser cannons. They seemed a little big for this ship and they shook the whole turret when they fired. “Whooooo!” yelled Jaycee as the guns pumped white hot bolts of energy into the first fighter. The fighter lurched side to side with each hit. Bits and pieces began to fly off in every direction. The pilot had had enough and banked to the right falling out of formation. “Yeah! Take that you jerk!” Jaycee yelled still firing. Lore could feel the other clone fighters shots hitting the rear of the ship just on the opposite side of the door he was press up against. “Hang on! “ yelled Stella as she punched a big red button over her head. There was a loud bang as if something had fallen off the ship then an ear shattering roar as some sort of booster rocket turned on. The G-forces were incredible. The ship was shaking violently and he could see Stella fighting the controls to keep the ship under control. “I told you it would work!” Jaycee yelled at the top of her lungs. She was being pushed toward the back of the ship by the G-force. Her face was bright red from being constricted in the harness. Stella didn’t respond due to the fact the ship had begun to spiral round and round going straight up. Lore’s face was plastered on the rear door looking out the view port the last thing he saw was the two clone fighters blasted out of control and spinning back down towards the planet. Mercifully Lore passed out. Lore awoke some time later. He knew they were traveling in hyperspace now by the stars streaking past the window. Stella was tending to Kang’s wounds and Jaycee was at the controls. “I don’t know who you ladies are or where you came from but thank you for the rescue.”Lore said. “You won’t be thanking us when you get the bill.” Stella joked looking at Lore. Lore wasn’t sure she was joking. “How is my friend doing?” Lore asked. “He’ll pull through, I gave him something to help him sleep, he just lost a lot of blood.” Stella said as she finished bandaging Kang’s wounds. “How did you know we were there at the temple?” asked Lore. “Lucky for us you were nearby.” Lore said. “Not so much luck as being prepared. Some of us saw what was coming and have been preparing for it. I was recruited because I was training to be a Jedi but never finished. They new me and they new I would help. Plus since I never finished my training I’m not on any list as being a Jedi.”Stella said. “Why didn’t you finish your training?” Lore asked. “It doesn’t matter, It was a long time ago.” Stella said looking down. It was obviously a sore subject for her so Lore left it alone. “ I with draw my question with respect to ones privacy.” Lore said smiling. “ Jaycee and I are recruiting just about any one who will fight against the Emperor, you fella’s want in?” Stella said. “To be honest, you answer to me until we get better organized. We’re going to have to wait and see who’s left to decide who will be in charge and who our friends will be.” Stella said looking out the view port as if awaiting an answer from the cosmos itself. “Well I guess given our choices Kang and myself will join your little group.” Lore said. “ Great, now there are four of us Kaycee.” Stella said looking over her shoulder. Jaycee just looked back and smiled. “ The Emperor will never know what hit him.” Stella said and smiled.